Vassar returned to its usually peaceful atmosphere after an eight-hour police standoff occurred at the residence of Denver Miller on Main Street. 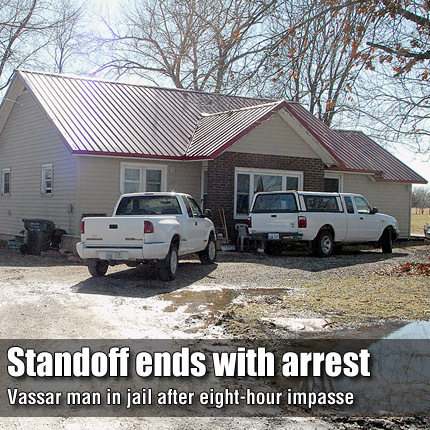 VASSAR—A Vassar man is being held in the Osage County Jail on $100,000 bond after an eight-hour police standoff last week. Denver R. Miller, 31, was arrested at his residence at 2601 Main St., Vassar, at 12:39 a.m. Feb. 23, after surrendering to law enforcement officers that had surrounded the home since the afternoon of the previous day. According to Osage County Sheriff Laurie Dunn, at 4:17 p.m. Feb. 22, a member of Miller’s family reported a distraught person armed with weapons in the home, although Dunn declined to name the reporting person. Dunn said when deputies arrived at the house, Miller’s wife, Alysa, was inside. “We worked out arrangements through a third party to get her out of the house,” Dunn said. After Alysa Miller left the home, “shots were fired,” Dunn said. Dunn said that during the afternoon, Denver Miller “came out on his porch and was shooting randomly.” During the subsequent investigation, at least one bullet hole was found in a nearby house, she said. She said deputies and other area law enforcement officers surrounded the house and an attempt was made to contact Miller. “In the beginning we did try to communicate with him via phone and yelling,” she said. Dunn said as the incident continued, several gunshots were heard inside and Miller came out on his porch several times, pointing a weapon toward officers more than once. She said when Miller was inside, officers could hear “yelling and carrying on,” indicating he was angry about something. Dunn said about 10 homes in the immediate area were evacuated and residents were allowed to stay at the Vassar schoolhouse, which was also used as a command center during the incident. Several residents went to homes of their family, she said, and one individual who had no other place to go was housed at the nearby Lamont Hill motel for the night. Several Vassar area residents reported law enforcement officers had cordoned off area roads and would not allow drivers to enter the town. Other area law enforcement arrived to help secure the area and two armored vehicles were positioned near the house. As darkness set in, the shooting stopped, Dunn said, and officers maintained a perimeter, relieving each other due to the cold weather. “When it’s cold, we can’t leave people outside for hours,” Dunn said. Later in the evening, upon arrival of a Kansas Bureau of Investigation negotiating team, contact was again made with Miller by cell phone. The team was successful in convincing Miller to come out. “The certified negotiators, they do a really good job,” Dunn said. At 12:39, Miller exited the home with his hands up. Dunn said that after Miller’s arrest, the home was searched and several guns were found, along with substances believed to be methamphetamine and marijuana. The day of the arrest, Osage County Attorney Brandon Jones filed five felony charges and two misdemeanor charges against Miller, including two counts of aggravated assault on a law enforcement officer, two counts of criminal discharge of a firearm at an occupied dwelling, possession of methamphetamine, possession of marijuana, and possession of drug use paraphernalia. The assault charges allege that Miller placed Osage County Deputy Bryan Johnson and Sgt. Scott Farmer in reasonable apprehension of immediate bodily harm with a rifle. Dunn said those two officers were closest to the scene and were threatened by Miller during the time he was on the porch. The charges also allege Miller fired at the occupied dwellings of Scott and Jill Stevenson, 23227 Elm St., and Christopher Hamilton, 23203 Elm St.
Dunn said the substances thought to be drugs would be identified with laboratory testing. Miller had been the subject of discussion at several meetings of the Osage County Commission over the past year, when several of his neighbors complained about him shooting in his yard. Miller did not attend any of the meetings, but in August he sent an e-mail to The Herald-Chronicle saying he only shot in a safe manner and did not endanger anyone. “I have shot for about a year and a half at this same location and have had no problems or mishaps what so ever,” Miller wrote in the e-mail. He also wrote that shooting in his yard was not illegal. Last year, at the county commission meeting, Dunn confirmed that it was not illegal for Vassar residents to shoot in their yards because the town is unincorporated and there are no ordinances prohibiting such activities. In November, Miller was also reported to the county commission by a Vassar resident who said he witnessed Miller shooting on the nearby Flint Hills Nature Trail, on which firearms are prohibited. Dunn confirmed this week that Miller had been interviewed about that incident, but no charges were filed. According to a document filed by Miller last week in Osage County District Court requesting a court appointed attorney, he has been unemployed since Jan. 13. He listed his former employer as Torgeson Electric. William Bayne was chosen as the court appointed attorney to represent Miller. A motion hearing in the case has been set for Thursday in district court.